José-Ángel and Anastasia Ávila-Rodríguez with their daughter Caterina. Three cities in one week — typical for GNSS signal and receiver engineer José-Ángel Ávila-Rodríguez. Begin on a Tuesday in January in San Diego, California, where he receives the Institute of Navigation 2009 Early Achievement award for outstanding contributions to navigation, including his role in inventing Galileo’s composite binary offset carrier (CBOC) modulation signal. Continue with a trans-world flight to Beijing on Wednesday, for ongoing work on compatibility between China’s Compass/Beidou system and Europe’s Galileo GNSS. Then back to Munich, Germany, where he and his young family begin packing for a move to yet a fourth city: Noordwijk, Netherlands, home of the European Space Research and Technology Center (ESTEC). Now, after several years as a research engineer at the Institute for Geodesy and Navigation at the University of the Federal Armed Forces in Munich, Ávila-Rodríguez begins a new phase in his career working with the European Space Agency (ESA) GNSS Evolution Program. There he will address similar topics as before, among others: GNSS signal design, and the thorny issues of how these signals will work together once the major GNSSes and the augmentation and regional systems are all up and running. The promise of the new European satellite navigation system, Galileo, presents challenges to the GNSS community and to Ávila-Rodríguez’s own work on compatibility and interoperability of global satellite navigation systems. Limited real estate in the international radio spectrum has called upon some of the best minds in GNSS to engineer the Galileo signals to avoid harmful interference with other systems sharing a frequency allocation. It’s a delicate balance. While knowledgeable GNSS users may be interested in interoperability, compatibility, and avoidance of interference are the critical factors for all GNSS system operators. European negotiations with China and Russia over frequency allocation and interference avoidance are an integral part of the signal design process. And finally, while the Galileo satellites are being deployed, Galileo receivers could also additionally use GPS signals to determine a position solution. “A real challenge at all levels,” Ávila-Rodríguez says. Today, Ávila-Rodríguez is a member of five different working groups associated with radio-frequency compatibility (RFC) between Galileo and GPS and between Galileo and GLONASS. In addition he is also working in support of Germany to establish compatibility standards with China and India. He undergirds this diplomatic work with serious scholarship. So far, he has authored more than 30 scientific publications in the field of satellite navigation. Born in Madrid, Spain, the young Ávila-Rodríguez dreamt of satellites and flights to the moon. He wanted to understand how things worked. Education helped satisfy his curiosity and prepare him to answer some of his own questions. By the time he was earning a master’s degree in electrical engineering at the Polytechnic University of Madrid (UPM) in Spain in 2003, the Galileo program had started to gain momentum. He saw an opportunity to get in on the ground floor of a discipline still relatively new to Europe and wrote his master’s thesis on the problem of compatibility and interoperability with GPS. Ávila-Rodríguez moved to the Austrian Space Agency in Vienna in 2002 to complete his studies and consult on the issues of interference and interoperability between Galileo and other GNSS systems. While working on Galileo topics, Ávila-Rodríguez took classes in international economics. His international orientation took a personal turn when he enrolled in a German class at a community college and met a young Russian attorney. Anastasia Aleksandrovna Chiriaeva had grown up in Omsk, a small town in Siberia known, among other things, for the prison camp where Russian literary giant Fyodor Dostoyevsky was exiled in 1849 for revolutionary activities against Tsar Nicholas I.
Chiriaeva was interested in civil applications of GNSS, and so the Russian and the Spaniard began their relationship speaking in German. After the first few years together, she asked to switch to Spanish, “a romance language more adept at expressing emotions,” she explained to him. 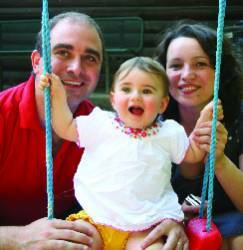 They married in 2005 and their daughter, Caterina, was born three years later. Meanwhile, during his time in Vienna, Ávila-Rodríguez found few published answers to his technical questions, and he went in search of them. He was led to two leaders in the GNSS field, Günter Hein and Bernd Eissfeller, professors at the University of the Federal Armed Forces Munich (University FAF Munich). The university’s Institute of Geodesy and Navigation turned out to be just as interested in Ávila-Rodríguez, as he was in them. His electrical engineering background and work on waveforms arrived at a critical time for the activities of the Galileo Signal Task Force. At that time, the task force was intensively working on developing the Galileo signal and frequency plan, where Hein was particularly active in all the activities as German delegate to this committee of the European Commission. A number of challenges still remained in developing the code and signal structure for the different services Galileo planned to provide. The intention was to achieve compatibility between GPS and Galileo signals in E1/L1 by ensuring no interference among any of them, particularly between the Public Regulated Service (PRS) and the M-code. Additionally, because Galileo shares the L5 band with GPS, the design of Galileo should minimize interference there as well. At this time, the E6 frequency was occupied by Galileo alone, but since then developers of other navigation systems such as QZSS and Compass have expressed interest in this band. The German government had designated the University FAF (in German, Universität der Bundeswehr München) to represent Germany in the European Commission for technical issues related to GNSS. Hein, as head of the Institute, was one of the main contributors in Europe, specialized in all problems related to signal frequency separation, which is the key for compatibility among GNSSes. These technical challenges offered a natural fit for Ávila-Rodríguez. He benefited from Hein’s mentorship through the next five years of his doctoral study, while assisting him on Galileo signal and code design, frequency management, interoperability among GNSSes, and future modernizations. It was a perfect symbiosis from which both benefited. In addition to Hein and Eissfeller, Ávila-Rodríguez also had the great luck to meet Stefan Wallner in 2003, a recognized expert on codes and interference, with whom over the next six years he would frequently collaborate, and to whom he also owes much of his success. Ávila-Rodríguez’s work contributed to the European implementation of the multiplexed binary offset carrier (MBOC) modulation that GPS and Galileo agreed to transmit on the future E1 OS and L1C services. He shares a patent* issued in 2005 for the European version of MBOC, called CBOC, which will be transmitted at least by Galileo. In 2008 Ávila-Rodríguez completed his thesis on Optimized Signal Waveforms for GNSS, for which he received the Parkinson award from the U.S. Institute of Navigation. That same year, Hein left the University FAF Munich, and Bernd Eissfeller assumed all of his responsibilities. Still, Ávila-Rodríguez maintained his contact with his professors. With a freshly minted Ph.D. from University FAF Munich, Ávila-Rodríguez continued to work on the Galileo system as a consultant with the Galileo Supervisor Authority (GSA) in Brussels, Belgium, as well as with IfEN GmbH in Poing, Germany, all while maintaining his home base at the University FAF in Munich. In March 2010, Ávila-Rodríguez began work at ESA/ESTEC in Noordwijk, continuing his work in signal and receiver engineering and helping forge the path to compatible and interoperable GNSS for international users to enjoy. Perhaps she is following in her father’s footsteps and dreaming of satellites, too.